Comfort Height® Compact Elongated bowl. 2-1/8" (54 mm) glazed trapway. Santa Rosa 1-Piece 1.6 Gpf Compact Elongated Toilet With Aquapiston Flush Technology In Biscuit The Santa Rosa Comfort Height 1-pc compact elongated 1.6 gpf toilet offers the exceptional functionality you expect from Kohler in a smaller footprint, so you can transform even the smallest of bathrooms into a well-designed, comfortable space. 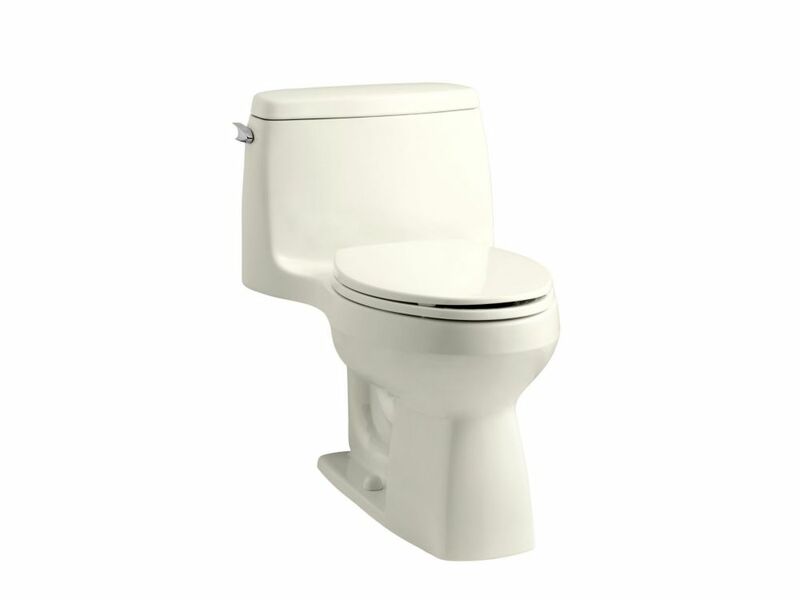 Santa Rosa 1-Piece 1.6 Gpf Compact Elongated Toilet With Aquapiston Flush Technology In Biscuit is rated 4.2 out of 5 by 40. Rated 1 out of 5 by AZPoorService99 from Ordered two toilets...first OK, second looks like a return - had wrong toilet seat - not soft clo... Ordered two toilets...first OK, second looks like a return - had wrong toilet seat - not soft close and not as in HD web site. Phoned and cancelled my HD credit card. Had it with poor service, particularly JD Logistics. Boxes arrived at by home in poor condition. Rated 4 out of 5 by George from Love the higher seating.... Love the higher seating. Rated 1 out of 5 by kpln from font buy Very disappointed in how cover fits, kohler molds for top and bottom dont line up and glaze doesn’t cover all exposed areas. Calling Kohler to complain. Rated 5 out of 5 by KEN from EXCELLENT LOOKS AND PERFORMANCE. NICE FLUSHING ACTION. MY ONLY REGRET IS THAT I WISH I HAD ORDE... EXCELLENT LOOKS AND PERFORMANCE. NICE FLUSHING ACTION. MY ONLY REGRET IS THAT I WISH I HAD ORDERED THE TALLER TOILET TANK.